A family-friendly weekend event for anyone involved in community groups taking action on climate change – community members, volunteers, project workers, board members etc. and their friends and family – 4-6 September 2015 at Comrie Croft. Are you working hard in your community helping make a lower carbon world or building local resilience? Are you looking for inspiration from exciting initiatives across Scotland? Would you like a group of like-minded people to reflect with and learn from? Want to share what you’re doing and hear what others are up to? For all this and more – join us for a family friendly weekend of workshops, good food and entertainment. You can join in for 1 or more days to take part in a programme that allows for networking, project best practice sharing, structured workshops, informal chats and time to enjoy the surroundings. Slowing down with nature walk: A walk through the lovely woods near the Croft, progressively slowing into an easier pace of life. ‘Are you Ready?’: Let’s talk about the weather! Short film and facilitated workshop on changing weather, adapting to climate change and creating resilience action plans. Hands in clay – part 1: A hands-on understanding of clay and where it comes from, some blindfold modelling and making some simple pots. Hands in clay – part 2: See your creations transform into ceramic using an outside bonfire. Film showing Symphony of the Soil: understanding and appreciating the elaborate relationships between soil, water, the atmosphere, plants and animals. Happy Monitoring and Evaluation: What would M&E look like if you were doing it for yourself? Find out how to use the logframe process to develop robust project plans, which have their M&E built in from the start. Land Art: Using what you find, working by yourself or with others, create your view of the future. We’ll start with a visualisation and finish with a tour of the creations. Climate Justice: Creates space for people to reflect on what matters most in their lives and how that may be impacted by climate change. Screen Printing: A printmaking workshop using found materials and drawing to design a tote bag or print on paper. Joanna Boyce and Philip Knight bring us ‘The Way of the Woods’. While the adults workshops are running, kids activities will have a woodland animal theme with physical and creative activities in nature. The kids will meet several Scottish-native ‘Animal Guides’ who will help them discover fact and legends about woodland flora and flora. The activities will be varied and fun with a mixture of bush-craft,nature detective work, art/crafts, physical exercise,quiet observation and meditation. Provided by Common Good Food’s Mags Hall (formerly of Fife Diet), fresh local produce will be sourced to create incredibly tasty meals for us. What can you contribute to the event? *CONVERSATION TOPIC: If there’s something you want to talk about with like-minded community activists – please put it down on the form and we’ll find a time to make it happen. * WORKSHOPS: Offer a workshop on something that interests you – anything from carbon counting to knitting or tai chi – this is your chance to share your skills and enthusiasms with the network. * HELP OUT WITH A TASK OR TWO: Every one who comes along is asked to help out with at least one practical task. * ENTERTAINMENT: Friday and Saturday evenings. We hope to put together a ‘scratch’ ceilidh band, so if you can play, please sign up . Or maybe you could do something for the open mic – could be bagpiping, stand up comedy, a poem or a game for everyone to join in… whatever you have to offer is very welcome. 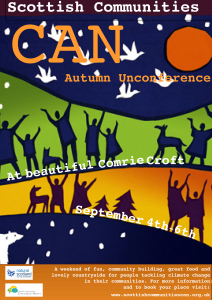 The Autumn Unconference is your opportunity to participate, contribute and learn – and to have fun and go away inspired and re-energised.